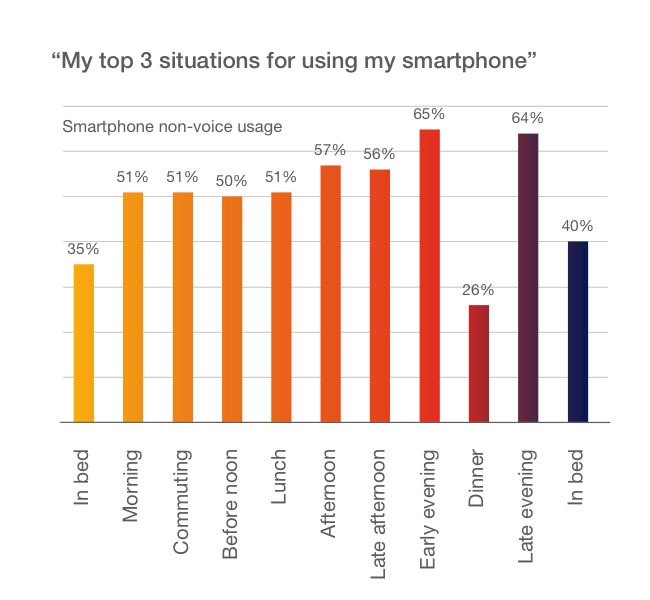 A new survey from telecom equipment maker Ericsson (PDF) finds that some smartphone users are very, very attached to their devices, finding that fully 35 percent of iPhone and Android users in the United States admit to using non-voice applications before they even get out of bed in the morning. Some 18 percent of those users say they log in to social networking apps before they get up—and Facebook is the most popular. However, social networking from bed only tied with late afternoon and early evening as the most common “situations” for tapping into social networking services. Smartphone users said they were more likely to use social networking apps in the late evening (34 percent), at lunch (26 percent), or in the morning (22 percent) after they got up. Overall, Ericsson finds that apps are the key to consumers’ smartphone use, rather than the devices themselves or the platforms on which they run. Ericsson characterizes “app culture” as a new way of living, and notes it is spreading to other devices like tablets. Where before smartphones consumers tended to access the Internet for relatively large, discrete blocks of time during the day, smartphones enable users to access the Internet in relatively quick sessions more consistently throughout the day, and also access the net “the very instant the get the impulse.” Ericsson attributes some of the change of behavior to how apps simplify getting information directly to users: instead of navigating a file system, finding a bookmark, entering an address, potentially logging in to a service, then hunting around for information, apps tend to put what consumers want front and center without the hassle of a traditional Internet experience. Ericsson also found U.S. consumers’ interest in tablets is almost as strong as their interest in notebook computers: when asked what device they were considering for their next technology purchase, 16 percent indicated a notebook was on their list, while 13 percent were considering a tablet. In comparison, 12 percent were considering a desktop computer, and six percent were eyeing netbooks and ereaders, respectively. And, another indication that the days of the iPod are over, only one percent were considering a digital media player.